ADF Security 11g login page failure is fairly common problem - I'm getting questions about this time to time and facing it myself from project to project. One of the most common problems - during first page access, ADF Security redirects to login page and it starts infinite redirect loop - login page is not loaded and application is blocked. If you are getting this error, make sure Anonymous application role is granted to login page definition, this means ADF will be able to load it for unauthenticated users. Read more about it here - Things You Must Know About ADF Faces Login Page. But there is something more to this, if you are still getting infinite loop when trying to login into ADF application - I will describe today what else you should check. Download sample application where ADF Security works and login page is loading correctly - SecurityFormLogin_v5.zip. Now double check previous screenshot. Do you see something tricky? Please think 5 minutes and read further if you managed to spot a trick. Just joking - let me describe it. In my case, developers were refactoring their project and moving page definitions into different folder - its why package structure was changed. However, not all occurrences of package naming was refactored by JDeveloper automatically - refactoring is always a tough task. When I tried to run this SecurityFormLogin app. in Jdeveloper (Studio Edition Version 11.1.2.2.0) it worked well. Later I deployed it to a standalone weblogic server (Version: 10.3.5.0) and it started to do the well known infinite redirect loop as usual. Another reason for getting infinite redirect loop is to forget to "Apply JRF Template" on managed servers. Thanks so much for writing this! 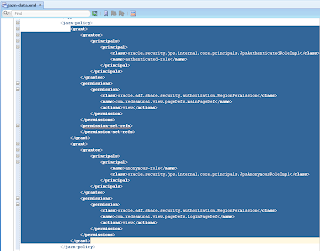 I've been trying to figure out why jazn-data.xml is pointing to the wrong pageDef files. These are great instructions for fixing it. Andrejus: You are a wealth of information, and I have used your blog posts many times to help answer questions. Regarding the above looping issue. We have everything set up correctly (anonymous-role granted to login page, etc. ), and the app works fine when we deploy it to a standalone WL server. However, after some period of time (could be hours, could be months), it starts looping on the login page. It also loops on ANY page that "anonymous-role" has been granted to ('public' pages). Nothing has changed from a code perspective - the app has been running fine. And, simply restarting the WL managed server 'fixes' the problem for 'a while' until it happens again. It almost appears that WL is losing track of the "anonymous" role, and starts requiring all users to authenticate. Oracle Support is baffled by this. And, of course, we can't reproduce the problem on demand, so it is almost impossible to troubleshoot. Any ideas? Any pointers would be greatly appreciated. I have seen such behavior, the issue was web caching filters. May be you have third party caching in front of WebLogic? It may fail to grant proper session id to ADF session because of cached data and then ADF starts looping. Thanks for the excellent blog. I have a login issue that I do not know where to start looking for the trouble. The application works fine for a while, login takes only a second or less. After some time, login becomes very slow, and it takes about a minute. Restarting WLS fixies it, until the next time it reocurrs. I followed same steps which you mentioned, given anonymous-role grant to login page and also checked package. Everything looks correct. But still it is going to infinite loop. I have created test application to verify, it works there. Do i need to follow any other steps? This post is very informative! Thank you. But there is another concern we sometimes face. My app uses the LDAP Authentication for login. Normally , the login has no issues, but sometimes, after we login, there appears a "Loading" symbol(typical oracle symbol) and it stays forever without displaying the actual home page. We have to fire the URL again in order to go to Home page. It seems that there is no config issue as many times we are able to login successfully. Does you have any idea about this issue?